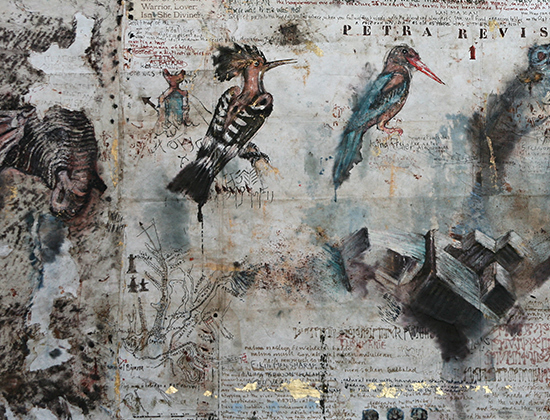 Created from her Notebooks, photographs, and sketches in the field, a new ‘Signature Piece’ (220 x 100 cm) painted for “Petra: Wonder in the Desert, with Bierenbroodspot”. The hoopoe bird (on the left), a symbol of good fortune, is taken from a preparatory sketch for an oil painting now in the Royal Art Collection of Jordan. It was gifted on the occasion of a Bierenbroodspot exhibition offered by H.M. Queen Beatrix and H.R.H. Prince Claus of The Netherlands on a state visit to H.M. King Hussein and Queen Noor of Jordan, held at the Royal Cultural Centre, Amman (1995).